Marlborough House is in Pall Mall just east of St James’s Palace. It was built for Sarah Churchill, Duchess of Marlborough, the favourite and confidante of Queen Anne. The actual design was probably drawn by Christopher Wren the Younger, under the supervision of his father. The foundation stone was laid in 1709 and the house completed in 1711. The red bricks were brought as ballast from Holland in ships that had carried troops and supplies to the Duke’s armies. For over a century it served as the London residence of the Dukes of Marlborough, but in 1817 reverted to the Crown. It was being prepared for Princess Charlotte, the heir to the throne, and her husband, Prince Leopold of Saxe-Coburg-Saalfield, however, she died in childbirth at Claremont. Prince Leopold lived in the house until he was asked to become the first King of the Belgians in 1831. The Dowager Queen Adelaide lived there from 1837-49 and from 1853 to 1861 Prince Albert arranged for it to be used by the “National Art Training School”, later the Royal College of Art. After they vacated it was substantially enlarged for the Prince of Wales to designs by Sir James Pennethorne (1861-63). He removed Chambers’ attic storey and replaced it with two of his own. A range of rooms was added on the north side, as were stables and a carriage porch. From 1863 until he became King Edward VII in 1901, it was the home of the Prince and Princess of Wales. During this period Marlborough House became the social centre of London. In 1936 Marlborough House became the London residence of the Queen Dowager, Queen Mary, widow of King George V,. She died there in 1953. In 1959 Queen Elizabeth II donated it to the Government for use as a Commonwealth Centre. 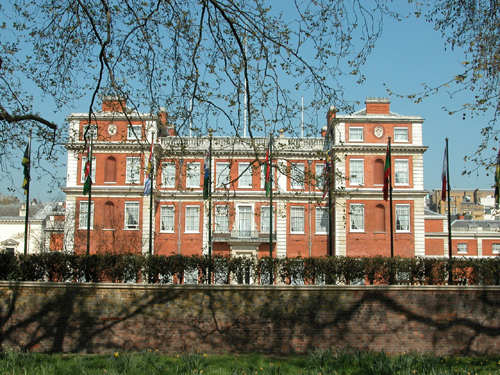 It was opened as such in 1962 and continues to be used by the Commonwealth Secretariat today. The house was extensively renovated between 1989 and 1993. It is listed Grade I.
I have carried out several projects here. Some years ago I was asked to examine the external brickwork to see if the red colour was that of the bricks alone or whether a coloured wash might have been applied. Most recently I investigated the decorative schemes in the Wren Room. I have also carried out paint investigations at the Churchill’s country house Blenheim Palace. 1 Walter J. Pearce. Painting and Decorating. Chas. Griffin and Co. Ltd. 1898. p.134. Thanks Kate. I don’t know, I’m afraid. Our work in the house has been purely analytical.